This variety was raised from seed planted in 1849 in Iola, Wisconsin by Jasen Hatch. (Some think that it is a cross between Golden Russet and Alexander.) Before Jasen Hatch realized what he had, he used the tree as a rootstock and grafted it. 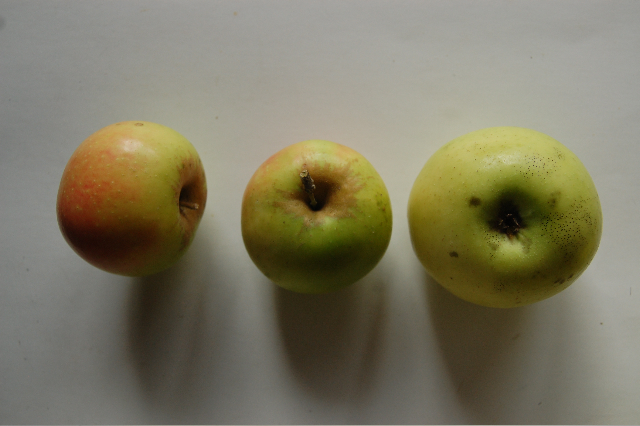 When the graft later died, the seedling rootstock took over and produced these wonderful apples. Northwestern Greening was introduced about twenty years later by E.W. Daniels in Auroraville, WI. In 1892 a bushel of NW Greening won first prize at the Chicago World’s Fair. 2012 was the first year we offered this apple in the CSA so we are excited to learn more about it. The flesh is crisp and tart, and we plan to use it for baking both sweet and savory delights. We would love to hear about your adventures with this apple.